Careers through Culinary Arts Program (C-CAP) is proud to announce that, with the support of The Gohan Society, C-CAP Alum Brother Luck, Chef/Owner of Brother Luck Street Eats in Colorado Springs, Colorado, was awarded a two-week scholarship to Japan to explore Japanese culture and cuisine. In addition, he was also awarded the inaugural The Joyce Chen and Helen Chen Foundation Fund Scholarship, extending his cultural experience into China for an additional week. The Gohan Society U.S.-Japan Culinary Exchange Chefs Scholarship Program is a ten-day gastronomic exchange program designed to educate and inspire American chefs on the principles of Japanese cuisine and culture. Brother Luck was selected to represent C-CAP and will travel with three U.S. chefs to Tokyo and Ishikawa Prefecture, where they will study Japanese cuisine, learn cooking techniques, and new ingredients from highly skilled Japanese chefs. Saori Kawano launched The Gohan Society in 2005 to foster an understanding of Japanese culture and heritage in the United States through outreach to chefs, culinary arts professionals and others who enjoy Japanese culture and cuisine. The Gohan Society offers master classes for chefs, lectures on Japanese tools and ingredients, workshops for high school students, culinary classes for the public, and scholarships for chefs to study in Japan. This is the first year that C-CAP and The Joyce Chen and Helen Chen Foundation Fund have partnered together for a scholarship, building on the longtime relationship, as Joyce and Helen Chen have been supporters of C-CAP since the organization was established in 1990. Joyce Chen and C-CAP Founder Richard Grausman shared a mutual enthusiasm and desire to help educate young people in the culinary arts. Over the years, the Chen’s have donated equipment and ingredients to C-CAP classrooms. Joyce Chen was a Chinese-American chef, restaurateur, author, television personality, and entrepreneur. She was instrumental in introducing and popularizing authentic Chinese cuisine to America - particularly the eastern and northern cuisines of Shanghai and Beijing. The U.S. Postal Service has honored her accomplishments and influence on American cuisine by including her in its Celebrity Chef Forever stamp series, released on September 26, 2014, which commemorates five chefs who revolutionized cuisine in the United States — Joyce Chen, Julia Child, James Beard, Edna Lewis, and Felipe Rojas-Lombari. Helen Chen established the fund to preserve her mother’s legacy with scholarships to aspiring culinary students through the auspices of the C-CAP program. The Scholarships cover all travel and housing expenses during his stay in Japan and China. Brother Luck was born in San Francisco and raised in a situation most couldn’t imagine. Both parents lived in Japan years before he was born, and he remembers growing up in a household where they still lived as if they were in Japan. They spoke fluent Japanese and loved to talk about the amazing country and the food. They enrolled him in a Japanese elementary school to begin his appreciation of the culture. His father died when he was 10 years old and shortly afterwards his mother ended up in prison, leaving him to fend for himself. Those were the roughest years going through adolescence. Eventually an amazing woman who had one rule in order to stay in her home, “go to school and graduate”, took him in. He enrolled into the culinary program and C-CAP at the age of 16 at Metro Tech High School in Phoenix, Arizona and it changed his life. The kitchen became the place where his passion was fueled to learn about food and culture. C-CAP spotted his talent and commitment to pursue a career in the culinary arts. He competed in the C-CAP Arizona Cooking Competition for Scholarships and was awarded a full-tuition scholarship to attend the Art Institute of Phoenix. While at the school, he studied with Chinese Master Chef Bill Sy and was dazzled by watching him carve the most beautiful fruits and vegetables and made Dim Sum so elegantly that he couldn't process his ease of the skill. Brother Luck worked his way from the bottom of the industry to owning his own restaurant with his name on the door. 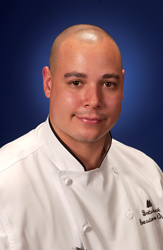 He was the executive chef for many restaurants including Craftwood Inn restaurant located in Manitou Springs featuring local Colorado cuisine and wild game selections, and the Hotel Contessa, a personal luxury hotel located in San Antonio, Texas featuring the signature restaurant Las Ramblas which specialized in Spanish cuisine. Prior to that post, Chef Luck was the executive chef for the World of Whirlpool facility: a private 28,000 square foot conference center in Chicago. His background also includes a role as executive sous chef for the Cheyenne Mountain Resort in Colorado Springs, Chef de Cuisine for Hyatt Hotels and Resorts, and guest chef at the famous James Beard House in New York City. On Sunday, June 26, 2016, viewers watched Brother Luck beat Iron Chef Bobby Flay on Food Network’s “Beat Bobby Flay”. He will also appear on an upcoming episode of “Chopped” on the Food Network. C-CAP is a national non-profit that transforms lives of at-risk students through the culinary arts and prepares them for college and careers in the restaurant and hospitality industry. Since being founded in 1990 by Richard Grausman, renowned cookbook author and culinary educator, C-CAP has awarded over $50 million in scholarships, provided job training and internships, college and lifetime career support, teacher training and product and equipment donations to classrooms. C-CAP works annually with over 17,000 students nationwide,. Through C-CAP’s efforts, a large percentage of its students find rewarding careers in the foodservice and hospitality industry with many alumni, now graduates of top culinary schools, working in leading restaurants and hotels throughout the country. C-CAP’s Board of Directors is led by award-winning chef, restaurateur and author Marcus Samuelsson and Mark Weiss, Chief Investment Officer of RFR Holding LLC, as Co-Chairmen. C-CAP’s President is Susan Robbins. For more information, visit http://www.ccapinc.org.